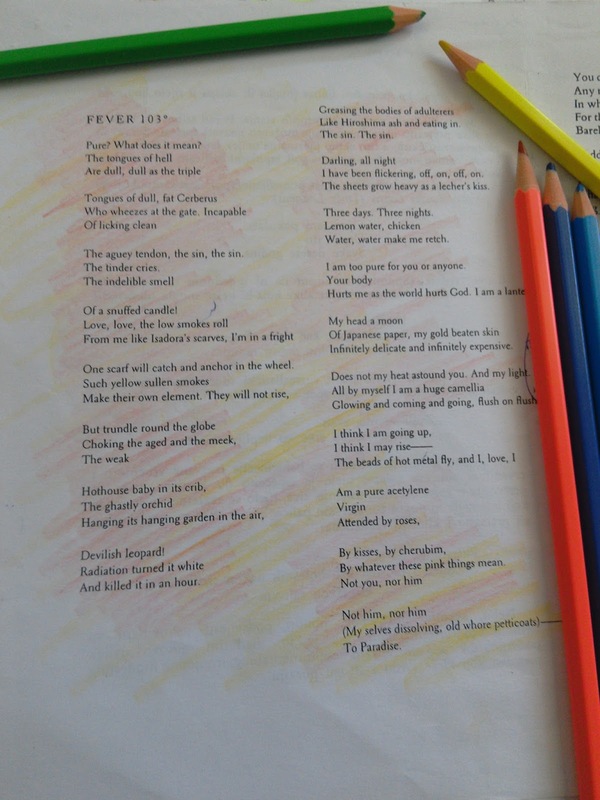 Fever 103 is one of Sylvia's best known poems and for good reason, I might add. I very much like it, but I must confess that I'm not quite sure that I fully understand it even now. Perhaps it is better that way, for this way I can always search for new intepretations of it. 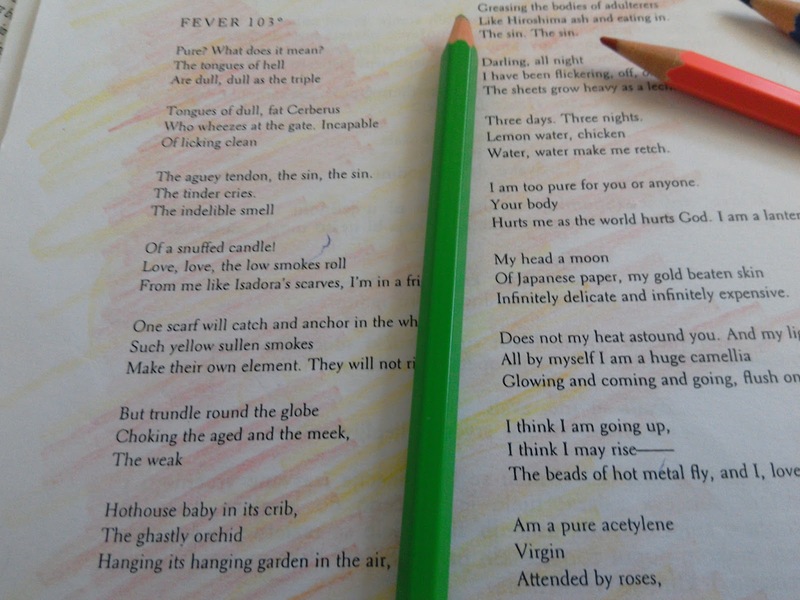 Fever 103 continues to fascinate me to this day. 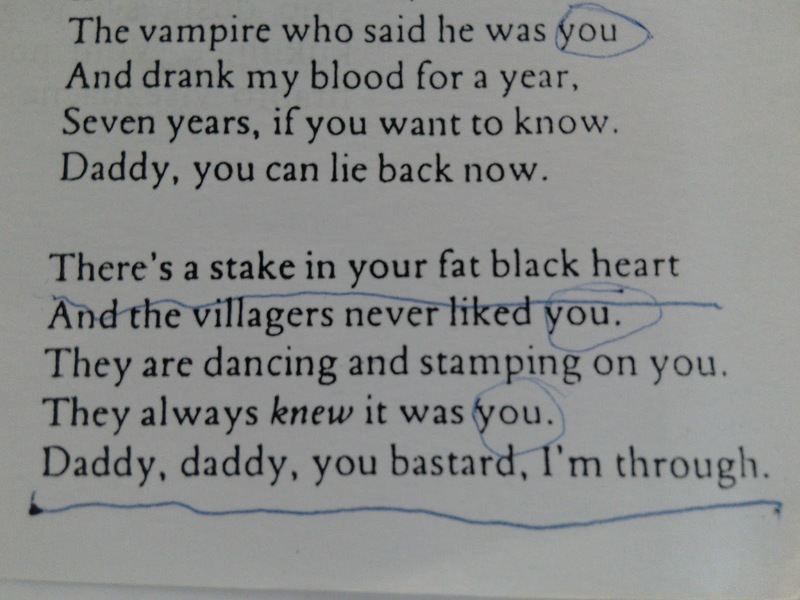 It is written in typical Plath's style. Her almost simple language is contrasted with the complexity of her themes. 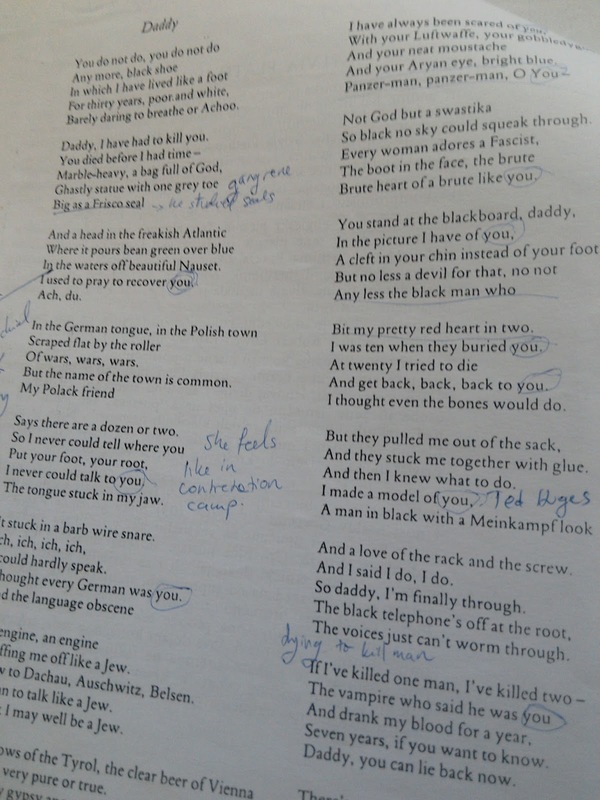 Like some other Plath's songs, it is composed of 18 stanzas ( 3 lines each). Feel free to have a look at it (here is a pretty decent study of it). How to you like it? It strikes me as a very powerful indeed, especially after I had listened to Sylvia's own reading of it. Moreover, I must say that I think that the best way to experience Plath's poetry is not by reading it, but by literally listening to it being read by Plath herself! It was only throught her own physical voice that I understood the depth of her poetical voice. I included one youtube video with her recital below, for more information- well, you know how internet works, don't you? Otherwise you wouldn't be reading this. Plath belongs to the confessional poets. Her poetry is focused on herself and on her personal experiences. For her poetry, Plath has received much critical acclaim. In fact, she is considered one of the most influential poets of the 20th century. Her short stories are equally praised. I haven't read them myself yet, but I plan to. Groznica 103 je jedna od njenih najpoznatijih pjesama, a ja bi mogla dodati s dobrim razlogom. Meni se jako sviđa, ali nisam sigurna je li ju i sada posve razumijem. Možda je i bolje ovako jer uvijek mogu tražiti nova tumačenja ove pjesme. Dan danas me nastavlja fascinirati. Napisana je u njenom tipičnom stilu. Njen jednostavni jezik je u kontrastu s njenim složenim temama. Kao i neke druge njene pjesme sastoji se od 18 strofa (kitica) od kojih svaka ima po tri stiha. Slobodno je pogledajte (ovdje možete pronaći pristojno tumačenje uz tekst). Kako vam se sviđa? Meni se čini da je veoma moćna, pogotovo nakon što sam slušala kako je sama Plath čita. Štoviše, moram reći da mislim da je najbolji način za iskusiti poeziju Plath ne tako što ćemo je čitati, nego tako što ćemo slušati Plath kako je čita! Tek sam kroz njen fizički glas osjetila i shvatila dubinu njena pjesničkoga glasa. Ispod možete pronaći jedan youtube video s njezinim recitalom, a ako želite znati više, pa znate kako internet radi, zar ne? Inače, ne biste ovo čitali. Plath pripada ispovjednim pjesnicima. Njena poezija fokusirana je na nju samu i njena osobna iskustva. Now, that we have talked a bit about Plath's poetry, let's talk about her novel, the only thing written by her that I didn't quite like. I know, shocking, for it is considered a great work of art, the holy grail of feminism, and what not. It might be considered a classic, but in my opinion, it is not deserving of that title. My experience of reading it lead me to conclude that it lacks depth. It may have something due to the fact that Plath was trying to write a potboiler (she wrote so both in a letter to her mother and in her journal). I had a feeling like Plath was holding herself back when I was reading this one. She was trying to make herself more accessible, but that didn't work out well. You can still feel a bit of her brilliance for Plath was uniquely talented. She was never meant for the masses and when she tried to work for the masses she failed....or did she? That's the question of the day. Did you read her only novel? That might not be your experience but in my view, this chaotical narrative told by a protagonist that isn’t exactly sympathetic, doesn’t have much going for it. However, it talks about important themes and that is one of the reasons why I don't regret reading it. Sada, kada smo malo pričali o njenoj poeziji, popričajmo o njenom romanu, jedinoj stvari koju je napisala a koja me nije oduševila. Znam, šokatno jer se smatra velikim umjetničkim postignućem, svetim gralom femizima i što sve ne. Da, smatra se klasikom, ali po mome mišljenju to i nije zasluženo. Moje iskustvo čitanja navelo me da zaključim da mu nedostaje dubine. Možda to ima veze s time što je Plath željela napisati roman koji će se dobro prodavati (napisala je to u piscu majci i u svojim dnevnicima). Imala sam osjećaj da se Plath suzdržavala kada je pisala ovaj roman i to nije ispalo dobro. Pokušavala je učiniti svoje pisanje pristupačnim, ali nije tako ispalo. Ipak se može osjetiti ponešto njene briljantnosti jer je ona bila jedinstveno nadarena. Nikad nije bila za mase, a kada je pokušala pisati za mase, nije uspjela...ili je? To je pitanje dana. Jeste li vi pročitali njen jedini roman? Možda to i nije vaše iskustvo, ali po mome mišljenju, ova kaotična priča koju priča junakinja koja i nije baš simpatična, baš i nema previše prednosti. No, govori o važnim temama i to je razlog zašto mi nije žao što sam je pročitala. Plath published The Bell Jar novel under a false name, because she considered it a pot boiler (something written for the masses). Original reviews and reception of this novel were lukewarm, but nobody knew who wrote it back then. It makes me wonder how we would feel about this book if it was not Plath's name on the cover. I can help but wonder what if....What if Sylvia never killed herself? Would she have EVEN let us know that she is the author of this novel? Would she had kept it a secret? Would she go on to write better things? Ironically, it was her suicide that gave this novel its life. Perhaps that is why I kind of dislike it. It is not that this novel killed her, but I feel like it took an unfair advantage of her death. I suspect that much of the praise The Bell Jar got was to make up for Plath's suicide, like our belated praise will do her any good. Let's not judge Sylvia Plath for what she did. We shouldn't idolize her either. There is no need. She truly was exceptional in many ways. A great writer indeed. Her poetry is raw and powerful. Let's appreciate it as such. We should not look at everything in the light of her mental illness and suicide. Plath was more than that and she deserves better. Plath je objavila Staklenku pod lažnim imenom, jer ju je smatrala trivijalnom književnošću (nečim napisanim za mase). Originalni ogledi i doček ovoga romana su bili mlaki, ali tada nitko nije znao tko ga je napisao. Pitam se što bismo doista misli o ovom romanu da na njemu ne piše Sylvia Plath? Ne mogu se ne pitati što bi bilo kad bi bilo.... Da se Sylvia nije ubila bi li nam IKADA dopustila da znamo tko je autorica ovoga romana ili bi to zadržala u tajnosti? Bi li napisala nešto bolje? Ironično, ali njeno samoubojstvo je dalo ovome romanu život. Možda ga zato i ne volim vrlo. Nije da je ovaj roman ubio, ali imam osjećaj da je nepošteno iskoristio njenu smrt. Čini mi se da je dobio puno dobrih kritika samo kako bi se nekako nadoknadilo njeno samoubojstvo, kao da će zakašnjele kritike učiniti joj dobro. 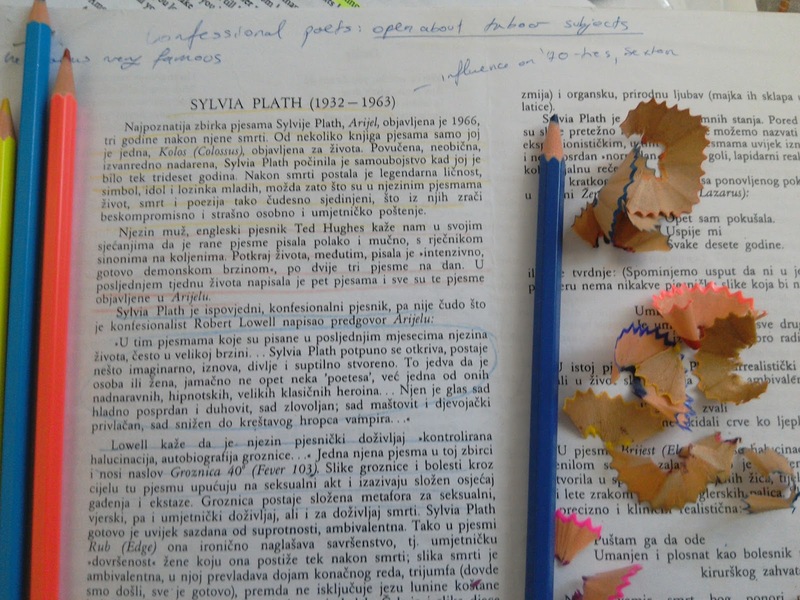 Nemojmo osuđivati Sylvia Plath za ono što je učinila. Ne bismo je trebali ni idealizirati. Nema potrebe jer doista je na puno načina doista bila izvanredna. Sjajan pisac. Njena poezija je sirova i moćna. Cijenimo je kao takvu. Ne gledajmo sve u svijetlu njene mentalne bolesti i samoubojstva. Bila je više od toga i zaslužila je bolje. 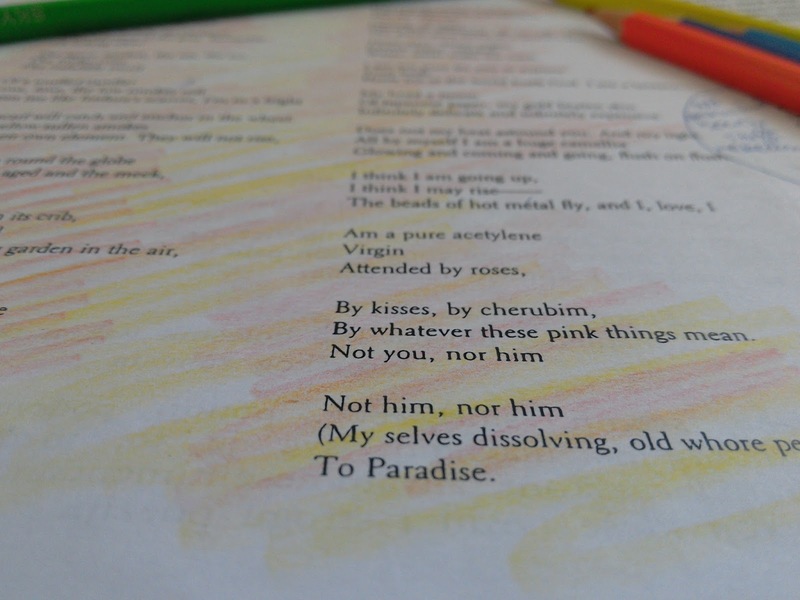 I love plath and her works. I remember reading the bell jar during a really difficult time of my life and it really resonated with me. Yes, the theme of The Bell Jar is a very difficult ones. I think it captures a challening time in any young person's life. thank you for reading:) Her poems are lovely. Sono onesta, non conoscevo questa scrittrice e leggendo il tuo post mi sembra anche un po' fuori dal mio genere però devo ammettere che mi hai incuriosita! thank you...I have never thought of her poetry as being feminine but you're right...there is something feminine and vulnerable about it. Might be why I like it so much! Such a delightful read my dear! I do love Sylvia Plath and I do consider her as a wonderful writer too. Sadly, the world lost her early. Still, her prose and poetry continues to reverberate in every literati's heart. I had a great time reading The Bell Jar though it is one of the most depressing work of lit. that I have ever read. Thank you for sharing with us a few of her best poems my dear! My favorite one from her must be the one entitled The Stone. Somehow, there are some lines in it that I couldn't get inside my head. yes, it is very depressing, isn't it? But I guess we can take it as a warning- mental illness are something that needs to be taken seriously. Plath was a great writer. Beautiful post, Ivana. Happy Sunday, doll. I've read this book but long time ago, back in 2006 in high school but I remember I liked it a lot! The way the words and the feelings were connected is something that not all writers can reach, but with Sylvia Plath it works! What I like about her is that feminine strong attitude she developed a long time ago but still considered as a great influence for women empowerment and feminist! It is amazing how we can find inspiration of the past to build the future we want, Plath will be there forever, so I'll definitely go and take a look at 'The Bell Jar' again, it deserves it! By the way loved how you showed your love for this writer with these pictures, tons of inspiration and powerful colors! Thanks for your sweet comments in every post, I really appreciate them! I've never read The Bell Jar but from what I understand it's a pretty polarizing piece of work and that most people tend to have strong reactions to it one way or another. I had no idea that Plath had originally had it published under another name. Dear Ivana, you know how much I love you blog and thought! I think and know that by reading books we open a new world that enriches our lives so much. The Bell Jar does so. Sylvia Plath's own life is as interesting as her book, but we should read her book with an open mind - maybe not connecting to her, but to ourselves. The verses make us think of life, in my opinion... or maybe I am biased, I think of mine :) It's so refreshing to read your posts because you teach us a lot - not like bloggers I know that only, really only think of impressing, wearing this and that to show "I am chic!" What's to be chic? To be polite, to be kind, but well, I don't want to judge anyone, I just want to praise your thoughts! Hope you have a nice week, dear Ivana! nekad je to stvarno teško odvojiti kao u slučaju Virginije Woolf, mislim da ni pisci ne znaju nekad gdje počinje, a gdje završava njihov život i njihova umjetnost. Madonnine pjesme s početka karijere nisu bile loše, ali da slažem se ona nikad nije bila neka posebno dobra pjevačica i bez tih nekih popratnih aktivnosti (privlačenja pozornosti) ne bi se nikada ni proslavila....ali u osamdesetima je pomicala granice, to joj se mora priznati. Gledala sam neki dokumentarac o njoj i njeni profesori s plesne akademije (od koje je odustala zbog pjevanja) su je strašno hvalili, ali valjda je shvatila da se od plesa ne može živjeti dobro, pogotovo onoga umjetničkoga:). Tolstoj je jedna od iznimki sa svojim mirnim obiteljskim životom, a možda je samo imao sreće što je našao dobru ženu koja je znala smiriti njegov umjetnički senzibilitet. Navodno je on njoj diktirao sva svoja djela, a ona ih je pisala ili ako bi on nešto zapisao ispravljala pravopisne greške i radila korekturu. Do you know that I've never read any Sylvia Plath. 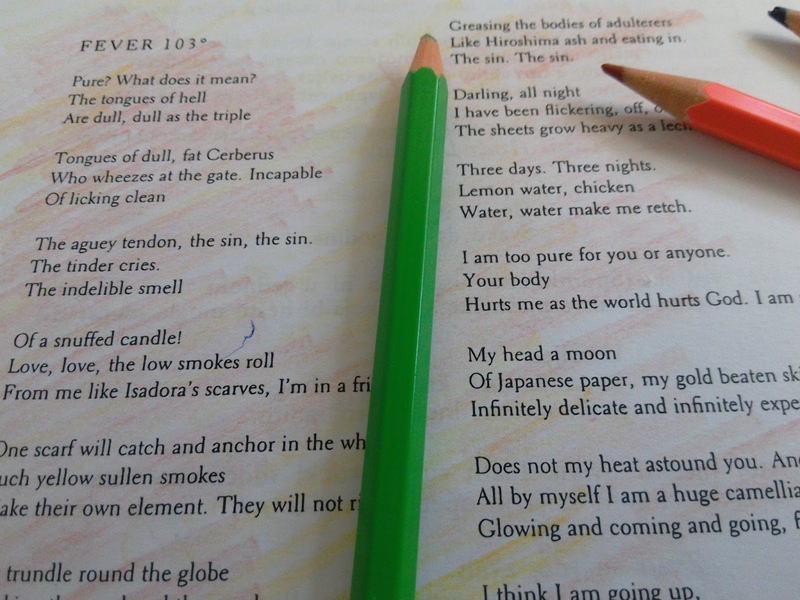 One of my fellow students chose her poem, was it the Mirror (?) for his Drama performances but I forget a lot! I can well imagine her daughter being so upset over the obsession with her suicide. I enjoyed reading your copy and seeing the Croatian side by side with the English! thanks:) I think you would probably enjoy her poems...her novel is really quite depressive, I'm not sure would it suit you. Još jednom se slažem sa tobom. Roman sam čitala još u srednjoj školi, pa iako se ne sećam baš tačno, pamtim neki utisak sličan tvom. To njeno samoubistvo je verovatno uticalo jer da se nije desilo, možda bi retki danas znali za Silviju. Većina umetnika kao da je znala da treba da bude najblaže rečeno, ekstravagantna, ne bi li doživela neki uspeh. Da su u pitanju bili "normalni" ljudi, nekolicina bi danas bila to što jeste. U svakom slučaju, Silvija je bila sjajna pesnikinja i tu joj skidam kapu. pa možda i ima nešto u tome, nekako se te nazovimo "normalne" ljude i podcjenjuje...Moram priznati da sam i sama vrtila oči kada bi netko spomenuo Stephanie Meyer i sjećam se da joj se Stephen King rugao jer u njenim knjigama nema seksa prije braka (ona je mormon mislim, uglavnom neki tip protestantske sljedbe u kojoj je to bitno), a onda sam pročitala njen roman The Host i oduševila se. Ne mogu reći ništa za Sumrak sagu jer ju nisam čitala, ali ovaj njen SF roman me baš pozitivno iznenadio i zapravo mi je bolji od ičega što je King napisao (svaka mu čast što je napisao toliko knjiga, ali nijedna mi nije bila ništa posebno, a gospodin Mercedes je bila katastrofa). Tako da ponekad je stvarno istina da podcjenjuju te neke tihe obiteljske ljude, ali zapravo to što netko ima tradicionalne stavove ne znači da ne može biti uspješan umjetnik baš naprotiv ljudima taj sređen obiteljski život može biti podloga za svakakav uspješan rad. yes, the book is quite depressive...and now when I visit it, I think it might have inspired Girl, interrupted. I actually have yet to read The Bell Jar myself, so I can't speak for the book. But her poetry is absolutely beautiful and she is by far my favourite poet. I consume her words all the time. And yes, that's such an interesting question - where does the author stop and the work begin to speak for itself? 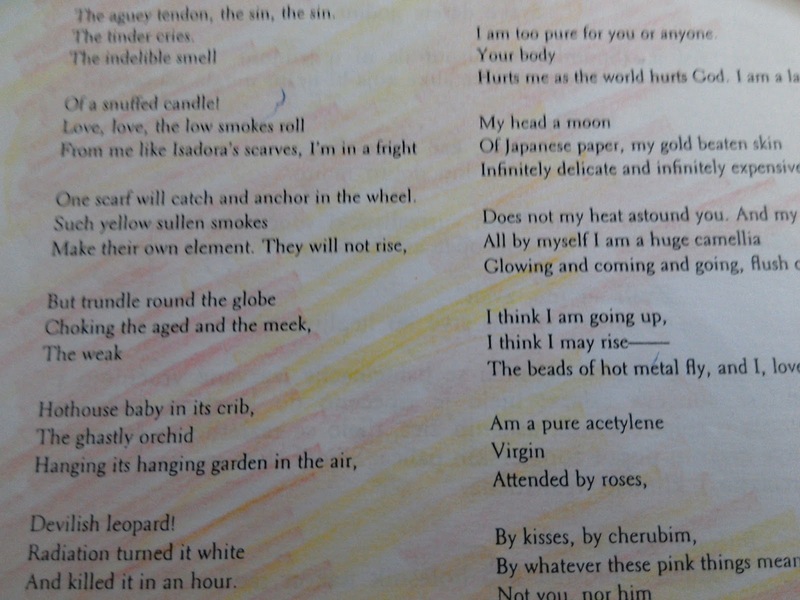 Although, if we are using the example of Plath we should also factor in her poetry. Yes, it maybe be famous for her death shortly afterwards. But let's say that death never did happen so shortly afterwards and in the way it did... would the Bell Jar still be famous because of her amazing poetry published beforehand? I think that too, should be taken into account. the reason why Plath didn't want it to be published under her name is because she didn't want it being linked with her poetry. So, even if she didn't die, perhaps the book would be famous anyway (if she acclaimed it as her own) because of her status as a great poetess. We'll never know, I guess.